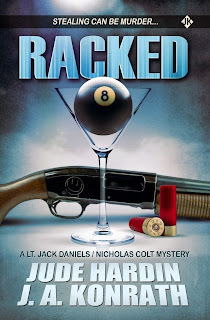 Racked by Jude Hardin and J.A. Konrath is a short story, about 45 pages long and available at Amazon for only 99 cents. A private investigator, a police lieutenant, and a man wearing a Bugs Bunny mask walk into a bar... Unfortunately, it's no joke when Bugsy rigs the barrel of a twelve-gauge pump to the back of the bartender's neck. Very excited for Jude Hardin. Visit his webpage for more Nicholas Colt stories. And I'm also excited to say that 2 of the 16 upcoming releases will feature my psychic detective, AJ Rakowski. BTW, note the cover art - fantastic! My stories (Abductions and Beatings - with Confessions almost ready to submit) will boast similarly excellent covers. When they're ready for display, I'll let you know.